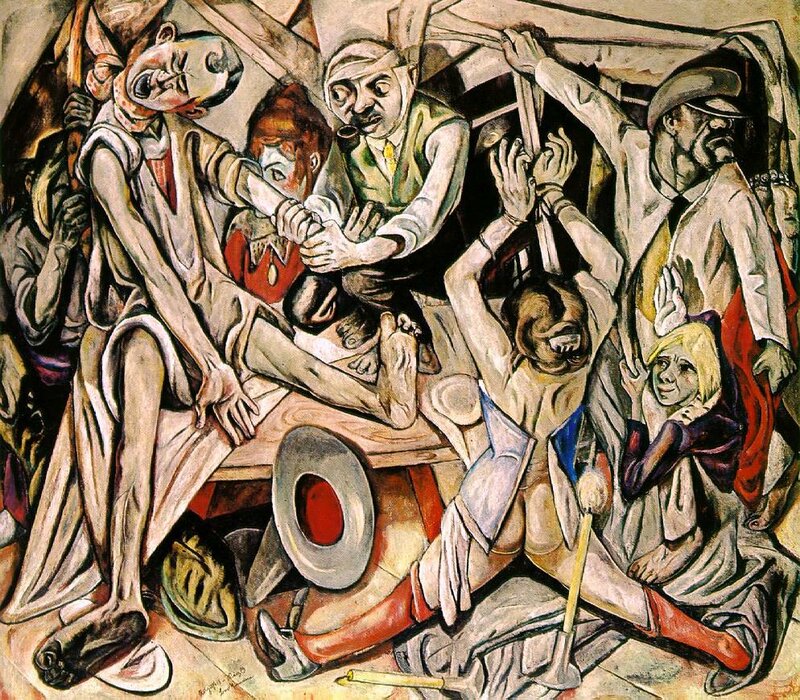 The Night is a 20th-century painting by German artist Max Beckmann, created between the years of 1918 and 1919. It is an icon of the post-World War I movement, Neue Sachlichkeit, or New Objectivity. It is an oil painting on canvas. [/br] Three men appear to invade a small, cramped room, where they terrorize the scene. To the left, a man is hung by one of the intruders, and his arm twisted by another. A woman, seemingly the man's wife, is bound to one of the room's supports after having been raped. To the right, the child is about to be taken away by one of the intruders—note the feet near the top right hand corner. [/br] The subject matter is instantly chaotic, amplified by the artist's use of color and form. The painting is limited only to brown tones and vibrant red shades. Also, Beckmann mastered a form commonly associated with early 20th-century Fauvism artists such as Henri Matisse: the painting is compositionally flat and stilted, with no implementations of depth. For instance, though the woman appears at the forefront of the piece, she is bound to the room's back entrance. The artist deviated from conventional avant-garde, non-representational paintings such as Cubism and Dadaism. The sporadic interruptions of vibrant red and the painting's intrusive angularity serve to shock the viewer, and animate the scene with chaos and energy.